Long before he was the richest person in the world, Jeff Bezos started his empire in the garage of this suburban Seattle home. The suburban Seattle home and garage where Jeff Bezos founded Amazon more than two decades ago is up for sale. The three bedroom, 1.75 bathroom home in the upscale city of Bellevue is on the market for $1,488,888. The online listing indicates Craftsman-style home was originally built in 1954 was rebuilt in 2001. It has an "enormous" great room 13-foot vaulted ceilings. The kitchen has maple wood and granite countertops. The master suite has a "divine" tiled shower. There's a deck out back with a hot tub. 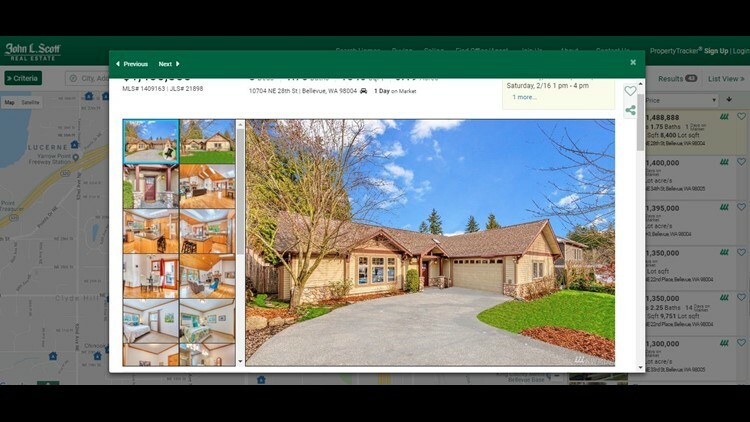 A screen shot of an online listing for a home in Bellevue, Wash., Feb. 11, 2019. The home is where Jeff Bezos founded Amazon in the 1990s. "A slice of history-Jeff Bezos started Amazon in the garage in the 1990’s!" the listing boasts. GeekWire reports Bezos rented the home for what was then known as Caldera, Inc.
Bezos now has a net worth of $131.6 billion, according to Forbes, making him the richest person in the world. That number is likely to take a hit as Bezos and his wife, MacKenzie, announced last month they are divorcing.